This is a bit late as it actually happened last October, but I just found the story on it. My friend Rachel Clark lives in Chicago and her boyfriend proposed to her in a pretty unique way. I was informed of the plan by her sister Christine prior to the event, and from all accounts it turned out pretty awesome. Eric Anderson wanted to do something big when he proposed to his girlfriend, Rachel Clark. So when he spotted the bus shelter at Sheridan Road and Surf Street with available ad space, he had found the site to declare his love to Clark -- and to commuters on Routes 134, 143, 151 and 156. Most importantly, it's the stop Clark uses most days. "At first I was afraid it wouldn't be very romantic -- it's a bus station," he said. "But I mentioned it to her sister and my cousin, and they were both excited about it. I had two women who liked it, so I went with it." Anderson, 25, contacted JCDecaux, which manages the city's bus shelters. The firm typically charges up to $3,000 a month for bus stop ads -- a price out of Anderson's reach. But his request pulled on the heart strings of JCDecaux account executive Sandy Pickett. "I approached my sales director," Pickett said. "Being a romantic, she said, 'Let's go for it!'" So the company let Anderson rent the space for one week at a discounted rate, and Wednesday morning, the proposal went up: "Rachel! I love you! Let's be a team forever! Will you marry me? XOXO, Eric." It included symbols of a heart (for love), the scales of justice (she's an attorney), a gear (he's an engineer for Ford Motors) and a knot (as in, let's tie the ...) running down the side. "I was lost in my own little world," Clark said of arriving at the stop Wednesday. "I marched up to the bus stop, and he was standing behind it. ... He's like, 'Read the sign!' I started giggling and laughing going, 'Yes, yes!'" As morning commuters ignored the Lakeview couple, Anderson got down on one knee and presented Clark, 28, with a stone passed down in his family for 130 years. Now, until the sign comes down, Clark gets to relive her proposal each day on her way to work. "It's kind of cool to have this sort of little secret in the morning," she said. "I want to be like, 'That's me! I'm getting married!'" (King) wrote "The Running Man", a 304-page novel, in only ten days. I'll start this off by saying that I haven't had cable television for almost a year and a half. I'll also go on record by saying that I've watched less than six hours of late night talk show in as many years, even when I had access. The format itself holds little to no interest for me. 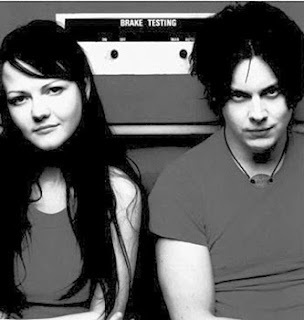 I would generally only tune in when someone I'm interested in is being interviewed or a band I like is playing. 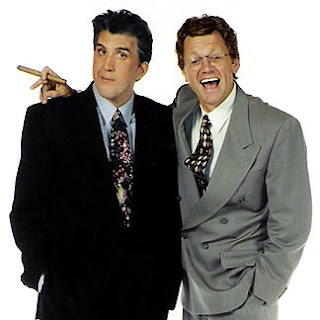 Having said that, I have been continually intrigued by the Conan v. Leno fight currently being played out at NBC. My interest is more of anthropological one in that the host of "The Tonight Show" is such a ceremonial position in our culture. I am completely unsurprised by this entire situation. 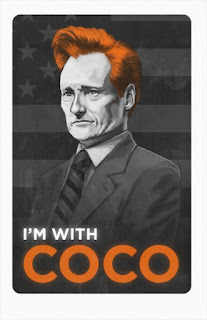 When I was shocked was when I first heard that Conan would be taking over for Leno several months ago. At that point I couldn't remember a time that I watched "The Tonight Show" when Jay Leno wasn't the host. Except for the last seven months I haven't had a moment of my life where I didn't think of "The Tonight Show" as a vaguely lame program that people much older than me thought was funny. What I am surprised by is how long Conan has lasted in his new seat of power. I would have thought this would have happened much sooner. It's painfully obvious that Jay Leno just likes being the definition of mediocre that he is and any change to the formula is dangerous. It's also been made apparent that Conan O'Brien is a smart, funny comedian who is at the very least relentlessly creative and self-improving. But in the land of the Snuggie and Sarah Palin did anyone ever have any doubt that the big, dumb "C" student would win the day? (Just ask David Letterman if you don't know the answer to that.) As Conan pointed out in his above-quoted statement, "The Tonight Show" is more than a show to many people (including him); it's an institution. It's a living museum whose curator stands as the face of modern comedy for the average American. And is there a better word to describe the current incarnation of Jay Leno as "average"? Congratulations, America, you win. You'll soon have your precious Jay back and you can all go back to sleep. Editor's note: The following is a partial transcription of the notes I took whilst traveling from Ukiah, Calif. to Mount Olive, N.J. to meet my soon-to-be father-in-law's extended family. Accompanying me was my fiancée Ash who took a separate flight from San Francisco that took her first to Chicago and then Indianapolis where we reconnected. From there we rode in the middle of a 2010 Dodge Journey. Also in the SUV were Ash's father Richard, her step-mother Mary, her brother Lan and his girlfriend Sarah. I'm in the very furthest part of Terminal 3 of the San Francisco International Airport when it turns midnight. A couple across from me stares at a cell phone waiting for the time to change from 11:59 to 12:00. The male counterpart is wearing Airwalks and a blue high school letter jacket that indicates a 2004 graduation date on the sleeve. At the stroke of midnight he loudly informs his ladyfriend that a couple behind me that I can't see are kissing. I shove my earbud headphones deeper into my skull even though, inexplicably, the left one is too loud and the right is too soft. Airports generally seem rather detached from their surroundings to me. It's like how foreign embassies technically belong to the land of that country no matter where they actually are. It's as if there is a spread out, diaspora country called "Airport" that is a bland, sovereign nation spread across the world that features many visitors and few citizens. In contrast, the Houston airport is dipped, slathered and baked in a mesquite Texas pride sauce. Maybe it's the fact that it's now 4:30 a.m. California time, but up until this moment I totally forgot that Houston is all about the space program. Themed restaurants, gaudy art and beaucoup advertisements now constantly remind me of this fact. I trek across what feels like an endless supply of concourses. 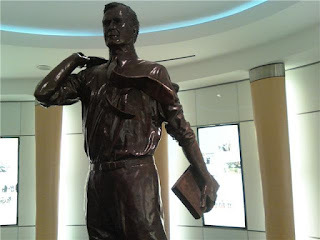 Halfway through the airport I the largest (and only) statue of George Herbert Walker Bush I've ever seen. 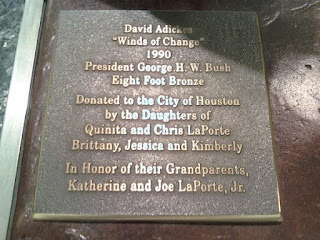 Upon closer inspection I find that it was dedicated in 1990 during what was one of the most popular points of his presidency. 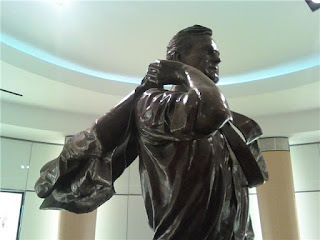 In this rendering his coat flails behind him wildly. 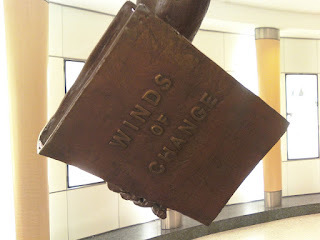 In his other hand there is a book entitled "Winds of Change." Behind him are panels have absolutely no time to read. When I get to my gate I fire up my laptop and unsuccessfully try to connect to an unsecured wireless connection. It is only then that I find that the entire facility is named "George Bush Intercontinental Airport." It's enough to make you wonder what something like that would do to one's ego. 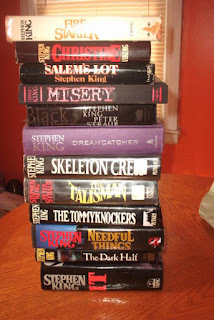 Also: Do you ever wonder what Karl Rove's personal library looks like? Well, then look no further than the display window of the inter-airport store "Simply Books." 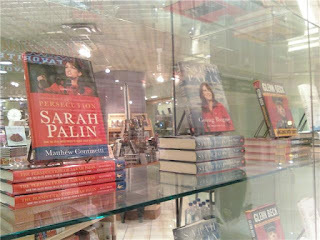 Of the six books in the window, two are about something called "Power Marketing," one is about 9/11, one is about and another (supposedly) written by Sarah Palin and one is by Glen Beck. Later, the Houston to Indianapolis flight I'm on features an in-flight magazine called "Continental." Even they can't get away from Houston fever. Inside there is a pull-out map of all the airline's routes. Squinting my eyes at this illustration, there appears to be major hubs in three cities I would have never expected: Cleveland, Newark and, of course, Houston. The enforced excitement about country's fourth-largest city continues in the subsequent pages. There's "Passport: 6 Unique Ways to Experience Houston," a photo caption promoting the 25th anniversary of Wrestlemania (held in Houston) and a map of all of the H-Town airport's terminals. The advertising takes this concept even further. There are no less than three Houston medical center advertisements: one each for heart, neurosurgery and dentistry. There are also two for real estate in gated communities. "If you're sick, come to Houston," these say. "Buy a house. Stay a while. In fact, stay for-ev-er." We're just about to land in Indy and the pilot has just announced for the second time that it will be 10 degrees outside when we land. I already know I am not prepared for this level of cold. I hated these temperatures growing up here, but after 2.5 years in California my hard Midwestern exoskeleton has been depleted. After seeing my mom and her best friend Marla at the airport for approximately eight minutes, we pile in the car and head east on Highway 70. At around 1:30 p.m. we pass Xenia, Ohio, which makes me think of the only fact I know about that place: that the most disturbing movie I've ever seen, "Gummo", was filmed there. After dozing off listening to National Public Radio's "Fresh Air with Terry Gross" on the radio, I wake up some 40 minutes later to the sounds of Ma$e's verse on Puff Daddy's "Been Around the World." I have no idea how this has happened. Without explanation, though, we're tumbling out of the car and into the Cracker Barrel restaurant we're parked in front of. The snow is coming down slowly and it's not sticking to the ground yet. These temperatures are not fit for humans. 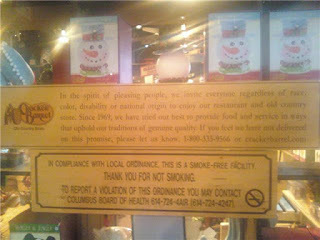 As we walk inside the place a sign greets us informing all who enter that the Cracker Barrel in no way discriminates against anyone. Funny. I would have just assumed they weren't prejudiced, but this sing makes me now think that there must have been some sort of incident that caused this sign. 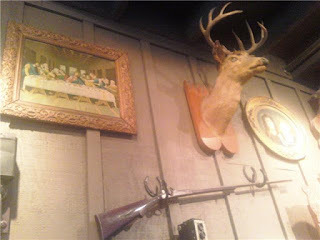 Inside the gift shop there are all the usual items you'd expect: a mounted deer head, a reproduction of "The Final Supper" and an antique rifle all live side-by-side on one wall. What I did not expect was that sheer amount of tchochkes bearing the likeness of country singer Alan Jackson. There's Alan Jackson toy 18-wheelers, Alan Jackson sunglasses, an Alan Jackson nature photography calendar. The kicker is Alan Jackson mosaic throw blanket. Sarah with Alan Jackson comforter. An employee comes over to ask for help, but we all can tell she's really making sure we aren't shoplifting. 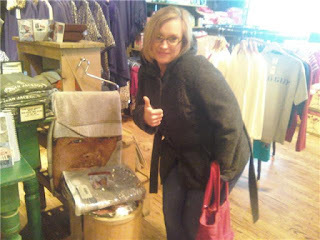 It's as if she think we're about to make off with the crowning piece of our home-made Alan Jackson shrine. Next to Nebraska, Pennsylvania is the state most likely to make you feel as if feels as if it will never end. This probably has to do with the distance between recognizable landmarks. Nebraska only wins the prize for total suckage because there is somehow even less to look at on the side of the road than the Keystone State. It's just after 11 p.m. and we're in Bellefonte, Penn. I deduce from the signs and propaganda that this is near State College, Penn., home of Penn State University. The snow has vacillated between blinding and non-existent for the last eight hours. Accordingly, the roadways have been nearly invisible at times as the falling snow began making long-term friendships with the cold, cold ground just before we left Ohio. We've passed at least three snow plow trucks on the highway and the resulting grime has resulted in a complete depletion of our windshield wiper fluid. We are now wandering through the deserted streets of Bellefonte looking for an open store to purchase more. The public trees are nearly the only lights burning, their branches still decorated from the recent Christmas holiday. We're all become sore and tired. We finally stop at one of the only stores still open, a Weis Market, where we purchase more fluid. There some bickering in the car over, well, nothing really. It's just the point in trip that the lack of proper circulation and leg room has started to break people. Just before 2 a.m. local time I'm poked awake by Ash who says that we've actually made it to New Jersey and that we'll be to our destination in a matter of minutes. I wouldn't say I was sleeping I was more just not awake directly before this. When I had last checked we were still in Pennslyvania after more than 300 miles. It felt as if we were on some kind of gigantic treadmill that made us feel like we were making progress east while not actually moving anywhere. Having been happily proved wrong I watch as we turn into our destination driveway. I'm beyond tired. I'm in the fourth dimension. When I meet my soon-to-be extended in-laws I feel more like a cartoon character than a human male intending to wife their relative. When I collapse on the air mattress they have set out an hour later the blackness that overtakes me is complete. It doesn't even compute that we left our apartment on the other side of the country 31 hours ago. Time means zero at this point. Once you've been moving long enough and you realize there's no stationary point in the distance to fixate on, reality is less of a concrete idea. It's more closely related to what you can grab on to, which at this point is nothing except the sheets I'm under.